There are five things that make for a great girlfriend weekend: great girlfriends, loud music, food, more food, and a little adventure. 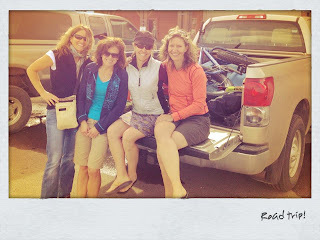 This last weekend I headed up to the Equinox Snow Challenge in West Yellowstone, Montana with three of my most intrepid girlfriends (and a pickup-load of gear) for what is surely the best 24-hour ski and fat bike event in the country. The goal of this event is FUN and personal challenge. Racers set out to ski, snowshoe, snowbike, or run as many laps as we can in a 3, 6, 12, or 24-hour period. You can change modes of travel at any time. Last year was our inaugural trip for the Equinox and we loved it so much that we came back for more. Each of us registered as soloists for the 12-hour event. I love to mountain bike but my skate skiing technique is pretty dismal. So this year my whole reason for being was to try out the fat bike. We stopped in Victor, Idaho on the way so that I could rent a bike at Fitzgerald's Bicycles. I had my doubts about my ability to ride one of these things in the balmy weather. Cheese and rice, I was wearing flip flops and shorts when I picked up Mabel (my bike, a Surley Pugsley). But I figured if I did just one or two laps on race day it would be worthwhile. Picking up Mabel in Victor. Thanks to my awesome friend Shelli at Have Media Will Travel for sharing her pics. 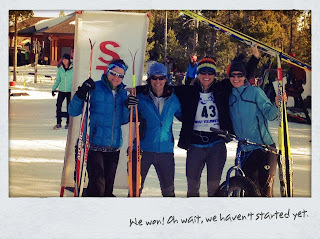 The pictures are proof to our husbands that we did go skiing. The menfolk are SO on to us. The Equinox Challenge has a great vibe. It's very low key and feels like a small town party, which it kinda is, especially this year with the spring-ski-in-your-shorts weather. There is a costume contest (last year we were superheros), music playing over loud speakers, a potluck, a fire, and great camaraderie. This year there were about 120 participants. For me, I love that it's not a race, it's a personal quest. I'm not competitive, partly because I'm slow (and always last!) But I do well with endurance which makes this event perfect for me. Every year I hope to do more k's than the last. Easier said than done. Last year the conditions were terrible because it was cold, windy and snowing. This year the weather was beautiful - warm and sunny - which made the snow conditions crummy: squishy and slow. If we ever get a cold-and-sunny combo I think I could make some progress. BUT, who cares if the snow conditions are bad when the weather is soooooo good? I'll take sunshine any day. I started out on the bike, which I was nervous about. Sure enough, two minutes into the race I tipped over a few times on the short stretch of single track. Then we hit the ski trails and it was PURE BLISS. The snow was so packed you could have taken a road bike on it. And the downhills were a kick - snow flying, jamming around the corners, wind in your hair, heart singing... Well, you get the picture. I loved the course, it was curvy and hilly and not too difficult. At least until about 1:00 pm. at which point it morphed into pure slush. But falling meant merely getting wet, no tree roots or rocks to contend with, no dirt rash. I could get used to fat biking. What could be more dorky than a middle-aged mom with a big cheesy grin on her face? For the record, there were separate courses for the skiers and bikers and the runners shared a course with the bike folks. (The grizzly bear tracks were on the ski track.) The way it was set up worked swimmingly. ﻿﻿At about 2 pm I decided to cut my losses with the bike before I didn't love it anymore and switched over to skiing. 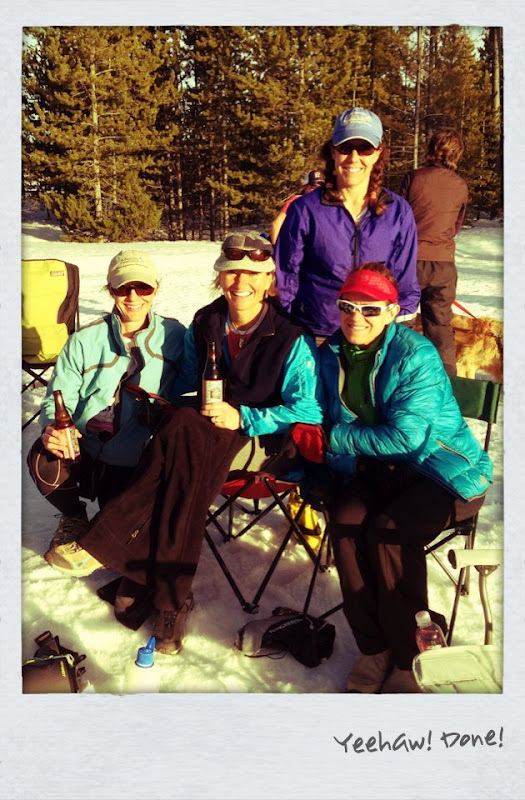 I chugged some Gatorade, ate an epic bar and headed out on the ski course. Wow, big mistake. I should have rested for a little as my quads cramped up halfway through the approximately 9 k. Ouch, that has never happened to me before. Chalk it up to standing climbing on the bike, my legs were shot. They froze up on every single hill, and I should mention that the "skiing" was pretty darn difficult. One of my good friends even said the "f" word when she skated/slogged by. She doesn't cuss and she's the toughest chick I know. Later on I had to check with her to see if I had heard her right (I thought it was lack of oxygen to my brain). It took me 2 hours to do my first lap, which is sick and wrong (not to mention embarrasing). The great thing, again, was the GLORIOUS WEATHER so I took a break and basked in the sun, ate my Marie Calendar chicken pot pie, and drank a ton - and was much better. At this point I was tempted to call it day and drink beer, like the more reasonable people who set up camp next to us. But for some bizarro reason I set out for more laps, I guess because I knew I could hang up my skis once we got back to Lander. The Equinox is a last hurrah for sure. Right before 7 pm I finished my last lap, having reached my goal for the day. Plus it was beer-thirty. It had been a great day, crappy snow aside, but I was so done. For me the "f" word was FINISHED. And also Fat Tire, the kind that you drink of course.